Almost every high-tech startup in the Bay Area outfits their office with Herman Miller Aeron chairs. And as some of the startups inevitably go out of business, the Aeron chairs hit the surplus office supply market, where people like me pick them up at a big discount. 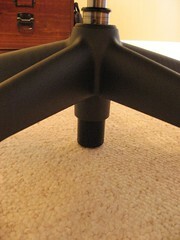 After bringing home my discounted Aeron chair, I noticed that the center post tended to drag against the carpet. The standard casters on Aeron chairs are designed for office carpets and solid floors, and don’t lift the chair high enough to allow the center post to clear a normal home carpet. 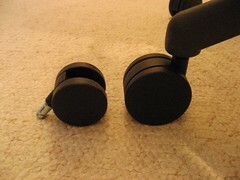 You can buy a larger set of Aeron casters from various sources, but they usually sell for at least $50 or more . To me, that’s pretty expensive for a simple set of casters. 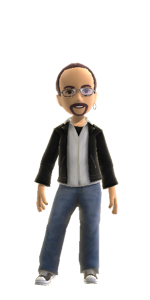 After sleuthing around the ‘net a bit, I was able to find the dimensions of the large-size OEM casters. A specialty store called “Great Lake Casters” sells casters of the exact dimensions for a mere $1.64 each. I ordered five. Installation was simple. I turned the chair over, popped off the old casters and popped on the new large ones. 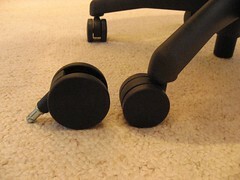 The new casters raise the chair by about 3/4 inch, which is plenty of clearance for the center post over the carpet.